In the 1930s and 40s, Los Angeles became an unlikely cultural sanctuary for a distinguished group of German artists and intellectuals—including Thomas Mann, Theodore W. Adorno, Bertolt Brecht, Fritz Lang, and Arnold Schoenberg—who had fled Nazi Germany. During their years in exile, they would produce a substantial body of major works to address the crisis of modernism that resulted from the rise of National Socialism. Weimar Germany and its culture, with its meld of eighteenth-century German classicism and twentieth-century modernism, served as a touchstone for this group of diverse talents and opinions. 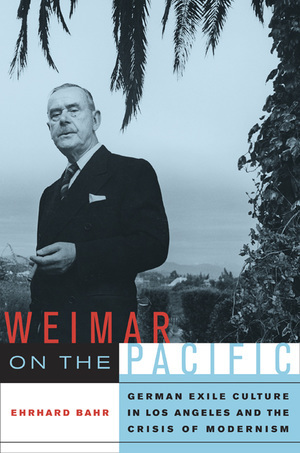 Weimar on the Pacific is the first book to examine these artists and intellectuals as a group. Ehrhard Bahr studies selected works of Adorno, Horkheimer, Brecht, Lang, Neutra, Schindler, Döblin, Mann, and Schoenberg, weighing Los Angeles’s influence on them and their impact on German modernism. Touching on such examples as film noir and Thomas Mann’s Doctor Faustus, Bahr shows how this community of exiles reconstituted modernism in the face of the traumatic political and historical changes they were living through. Ehrhard Bahr is distinguished professor emeritus of German at UCLA. 3. Bertolt Brecht's California Poetry: Mimesis or Modernism?